Do you incorporate participatory sessions into your events? 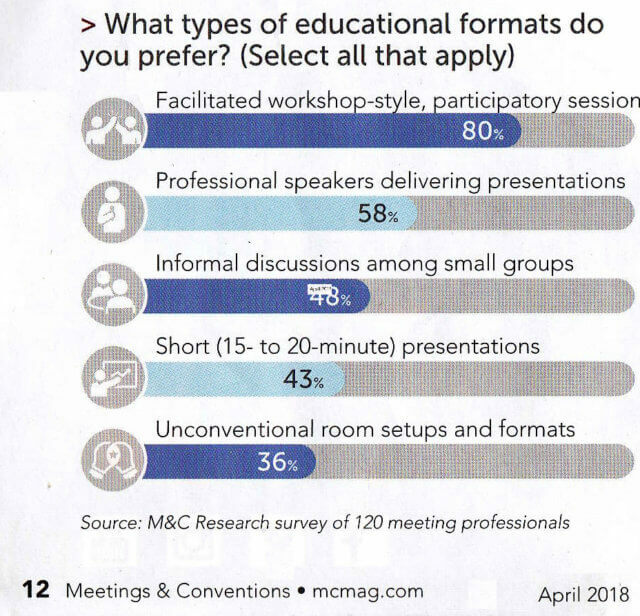 80% of meeting professionals prefer facilitated workshop-style, participatory sessions [survey by M&C Research, April 2018 Meeting and Conventions magazine]! That’s way ahead of their second choice: Professional speakers delivering presentations (58%). I’ve been designing and facilitating workshop-style, participatory sessions since 1992, and participants love them! Smart conference producers incorporate participatory sessions into their events.